Retro Hardware still being in use prove reliability of old hardware. 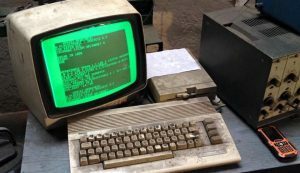 In auto repair shop in Gdansk, Poland they still uses a Commodore 64 to run its operations. Yes, the same Commodore 64 released 34 years ago that clocked in at 1 MHz and had 64 kilobytes of RAM. It came out in 1982, was discontinued in 1994, but it’s still in service in this company in 2016. In case you are retro fun and you happen to be in Gdansk Poland visit this shop. Respect. If you know for some other retro hardware still in use please let us know. Previous Previous post: SPACE CHASE! Next Next post: Vampire 500 v2 Amiga FPGA Accelerator – World premiere!